Eric LeGrand is a former defensive tackle for Rutgers University. In October 2010, he became paralyzed in-game while making a tackle, but has since regained movement in his shoulders and sensation throughout his body. LeGrand is undoubtedly a fighter and during his recovery said "it's not even whether you keep breathing, it's whether you keep breathing how you want to breathe." In 2012, the Tampa Bay Buccaneers signed LeGrand to a symbolic contract as an undrafted free agent by his former Rutgers head coach, Greg Schiano, who has recently taken the helm in Tampa Bay. Since his injury, LeGrand has begun writing and speaking about his experiences highlighting a never say die attitude and teaching people to persevere even when the chances are slim. 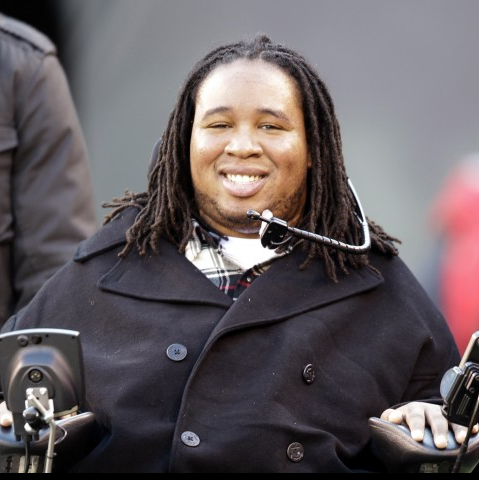 His novels The Victorious Story of Eric LeGrand (Young Readers' Edition) and Believe: My Faith and the Tackle That Changed My Life, Eric tells the story of how he is rebuilding his life, continuing his education, and pursuing a career in sports broadcasting. Outside of your profession do you have any hobbies/interests? I love to travel and go visit different places around the country and the world. Vegas, LA, Miami, Caribbean, Costa Rica, you name it. Who do you look up to as a mentor and why? I look up to Eric Thomas for his perservarance and story and Gary Vaynerchuk for his confidence and positive mindset.